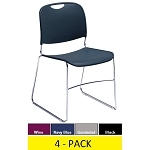 Do you need a place to store your National Public Seating Chairs? And how would you like an easy way to transport your National Public Seating Chairs from one location to another? The DY-85 National Public Seating Chair Dolly provides you with just that. Made of 11-gauge steel this is a sturdy chair dolly. 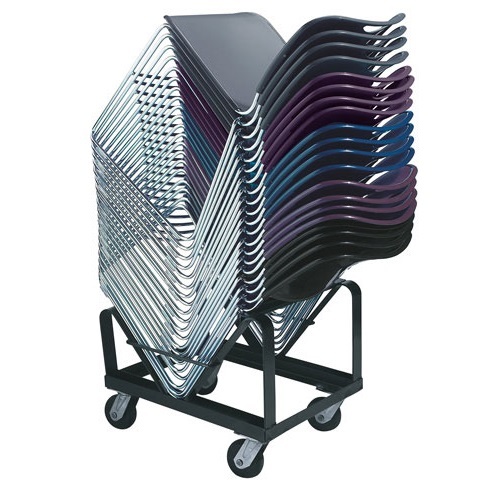 Chairs stack diagonally to maximize stack-ability and you can fit up to 40 NPS series 8500 chairs on it. That's right, 40! The Dolly comes with two fixed casters and two swivel casters to allow for mobility. The casters are made from hard rubber so, like the rest of the dolly, they are built to last. This purchase also comes with a 10 year warranty so you can buy worry free, knowing that the dolly was built to last. With fast shipping and at an affordable price this is not an offer you want to miss! So, buy today for a place to store these chairs and an easy way to transport them! Please note that this chair dolly is compatible with NPS 8500 series stacking chairs only. All NPS dollies are made in the U.S.A.
Q: To these work for all stacking chairs? A: These are designed to work with models made by National Public seating in the 8500 series. There is no guarantee they would work with other brands and models. Fast Shipping: Orders for the DY-85 National Public Seating Chair Cart generally leave the warehouse the next business day. Delivery Details: This product ships directly from the factory in Clifton, NJ. This item ships via FedEx and may not require a signature. Dimensions: 27" x 22" x 21"